« Where Would You Hide a Renaissance Fresco by Da Vinci? Florence. 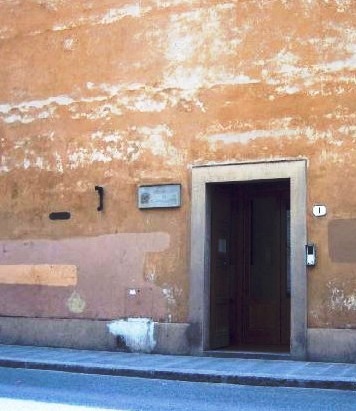 Not far from the Piazza San Marco, in the midst of one of but many, nameless, stucco walls is an unassuming aged wooden door. Those visitors headed to Michelangelo’s David at the Accademia delle Belle Arti take little notice of such an ancient entrance. Were they to take a moment to enter, they would be rewarded with one of the rarely visited treasures of Florence, the refectory of the once Benedictine convent of Sant’Apollonia. The convent, founded in 1339, is named for Apollonia who was martyred in Alexandria during an uprising in 249 A.D. She became the patron saint of dentists. Why? Her teeth were knocked out of her mouth before she voluntarily surrendered herself to the martyr’s flame.The iconography of her sacrifice is a single tooth, held in her hands by a set of pincers. In contrast to the dark details of her death and the nondescript exterior of the building, the refectory prov ides a feast for the eyes. 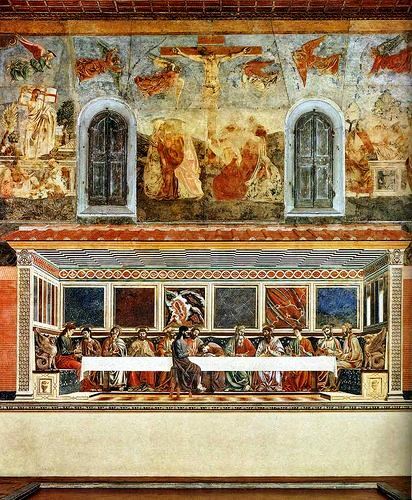 In 1447 Andrea del Castagno received a commission from the Benedictine Prioress to paint a Last Supper (in Italian, Cenacolo) on the western wall of the refectory. Castango’s work harkens to the work of Leonardo da Vinci at the Convent of Santa Maria della Grazie in Milan. 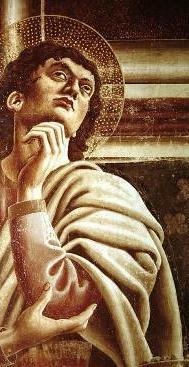 Leonardo is said to have studied Andrea’s work before beginning work on his Milan fresco in 1495. Above the fresco of the Last Supper are three additional works by Castango; Crucifixion, Deposition and Resurrection. These three frescoes, whitewashed by the nuns of the convent in strict adherence to their order’s rules, were rediscovered in 1860. During the fresco’s 1952 restoration, these three smaller works were removed for cleaning, then returned to their intended position above the Last Supper. Unlike the vast majority of frescoes in Florence, crowded and well known, the vast space of the refectory is rarely occupied by more than a few visitors. When the sun moves across the fresco in the mid-afternoon sun, the strokes of genius, carefully and lovingly applied by the artist, stand out from the work. This is a quiet place to treasure in the midst of a city of crowds. Go, and marvel at Castangno’s luminous work. Sundays – 8:15 am-1:50 pm; open on the second and fourth Sunday of every month; the ticket office closes 30 minutes before the museum closing time. Weekdays – 8:15 am-1:50 pm; open on the first, third and fifth Monday of every month; the ticket office closes 30 minutes before the museum closing time. Closed: closed on the second and fourth Monday of the month; closed on the first, third and fifth Sunday of the month. December 25, January 1, May 1.